The SGR-ReSI, (Space GNSS Receiver Remote Sensing Instrument) is flying on-board TechDemoSat-1, a technology demonstration satellite which was launched in July 2014. SSTL’s SGR-ReSI collects the signals from GPS and other navigation satellites after they have been reflected off the ocean surface and processes them into images called Delay Doppler Maps, from which ocean roughness and wind speed measurements at the sea surface can be interpreted. The technique works in a similar way to existing scatterometric radar from satellites, but it eliminates the need for a transmitter. Up to four reflections can be processed from different GPS satellites simultaneously, presenting an opportunity for collecting data more regularly and in a dense grid across the globe. 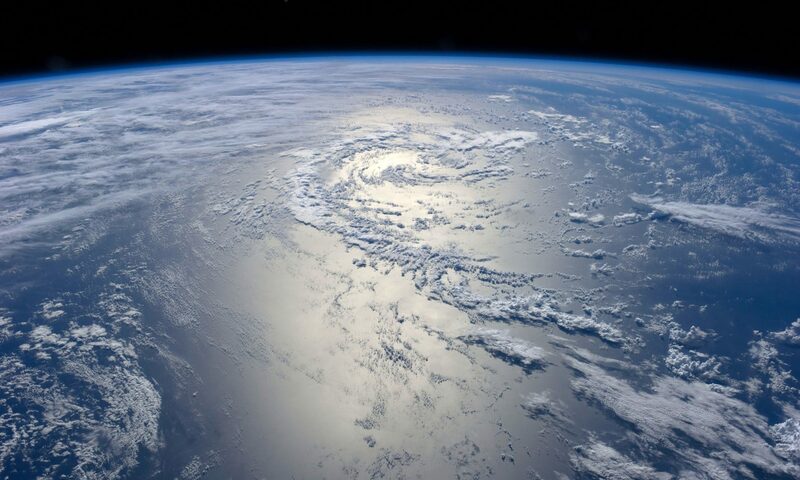 By flying the receivers on a constellation of small satellites GNSS Reflectometry data could be used to map all of the Earth’s ocean surfacewith refreshed data every couple of hours. This would be of enormous benefit to meteorologists, scientists and the maritime industry who depend on wave height and wind speed predictions for optimum ship routing, insurance claims, oil and gas rig operations, undersea cable laying and fishing conditions. Such wind speed and wave height measurements are currently very difficult to make over the open ocean in timely manner and in a dense enough grid to be useful. The technology demonstration satellite, TechDemoSat-1 (TDS-1), shown below, has been developed in the UK under sponsorship of the UK Space Agency and Innovate UK (Technology Strategy Board) and with contributions from the payload suppliers. TDS-1 was launched from Baikonur Cosmodrome on a Soyuz-2 launcher on 8th July 2014. TechDemoSat-1 is based upon a standard SSTL design, the SSTL-150. With its 8 payloads, the satellite is approximately 160 kg. 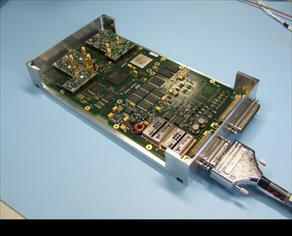 It is capable of accommodating around 52 watts of orbit-average power and can store up to 128 GBytes of payload data. It has S-Band and X-Band downlinks capable of operating with experimental downlink speeds up to 400 MBps. It has 4 wheel slew agility, and new generation star trackers, gyros, magnetometers and torque rods. 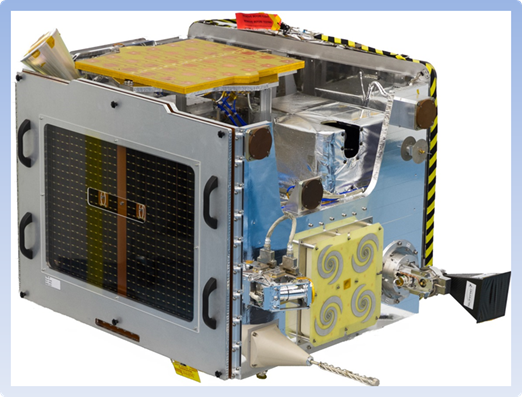 The SGR-ReSI is one of the eight UK payloads hosted on TechDemoSat-1 (others including an altimeter, radiation, charge and atmospheric measuring instruments, and deorbit sail) alongside a number of new SSTL platform technology demonstrations. The main two purposes of the SGR-ReSI on TechDemoSat-1 are to demonstrate its core GPS capability, and to demonstrate the technology and science required for GPS Reflectometry through the operation and collection of data over the ocean. Secondary aims include demonstration of some of the SGR-Axio’s planned extra capabilities – such as multi-constellation and multi-frequency operation. Surrey teamed with National Oceanographic Centre in Southampton and with other partners, University of Surrey, University of Bath, and Polar Imaging Ltd to develop a new GNSS Reflectometry instrument to collect more data and allow processing on-board using a powerful FPGA. A schematic of the SGR-ReSI is shown below. The SGR-ReSI is a COTS-based design that in effect fulfils in one module what might be handled by three separate units on previous spacecraft. a) It performs all the core functions of a space GNSS receiver, with front-ends supporting up to 8 single or 4 dual frequency antenna ports. 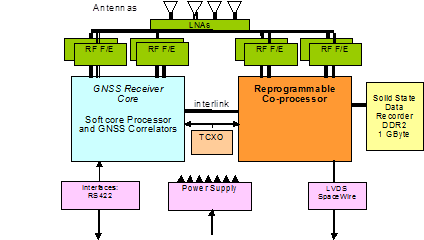 The RF front-ends are connected to the main GNSS processing (processor and correlator) implemented in a Flash-based FPGA. A second FPGA acts as co-processor and is reprogrammable even in orbit. 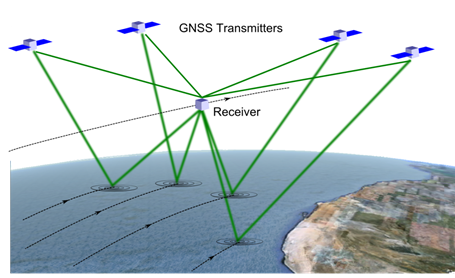 The SGR-ReSI has two operating modes – either short bursts of raw (unprocessed) data can be stored in the data recorder, or the co-processor can be used to real-time continuous processing of the raw reflected GNSS data into Delay-Doppler Maps (DDMs) on-board, from which the sea state measurements are made. The algorithms for on-board processing were initially demonstrated as part of a PhD study, but were subsequently fully implemented and tested within the SGR-ReSI, with support from ESA, and in conjunction with the CYGNSS project. The unit is around 1.5 kg in mass, consumes approximately 10 watts, and fits within half of an SSTL standard satellite micro-tray (approx 300x 160 x 30 mm). It doubles as a platform GNSS receiver, and could potentially be flown on multiple satellites to increase coverage, without major cost. The first flight of the SGR-ReSI is on the TechDemoSat-1 satellite, launched July 2014. It has also been use in the 8 micro-satellite NASA CYGNSS constellation.